The 100-storey 5-star green building is set to attract more interest to the whole development. BACK in 2000 when Permodalan Nasional Bhd (PNB) was presented the opportunity to buy the 14.5ha where Stadium Merdeka and Stadium Negara are located, it had decided to retain the heritage value of this priceless asset while looking for opportunities to develop the surrounding area. A decade later, PNB is doing precisely that. 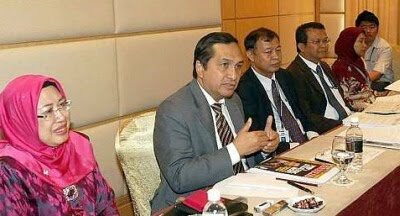 PNB paid RM310mil or RM220 per sq ft to buy the land from Pengurusan Danaharta Nasional Bhd. The market value of the land has since appreciated to RM800 per sq ft today. From left: PNB deputy president for corporate and international Jamiah Abdul Hamid, Tan Sri Hamad Kama Piah Che Othman, PNB Merdeka Ventures CEO Tengku Abdul Aziz Tengku Mahmud and PNB senior-vice president, head of property division Ibrahim Awang at the briefing. At a special briefing for media editors on Wednesday, PNB president and group chief executive Tan Sri Hamad Kama Piah Che Othman disclosed that the heritage aspect has been fulfilled through conservation works to restore the heritage characteristics of Stadium Merdeka and Stadium Negara. The two stadiums are now being managed by a heritage trust. Both the stadiums are occupying 6.8ha, which have been identified as a national heritage site. Hamad says the overall Warisan Merdeka development on the remaining 7.7ha will complement and blend with the heritage theme. He is optimistic that together with the restored stadiums, the site will be another major landmark in Kuala Lumpur. “We are looking at ways on how to integrate the building aspects of the stadiums with the planning of the overall development of Warisan Merdeka. The heritage part will not be sacrificed and will actually serve as the enhancement factor to the commercial aspects of the building. The heritage preservation of the stadiums will be undertaken by the heritage trust,” he explains. Construction work on the 100-storey Warisan Merdeka tower will kick off next year. Touted to be the country’s tallest when it is completed in 2015, the building will cost RM2.5bil to RM3bil. It will have gross floor space of 3 million sq ft and 2.2 million sq ft of net floor space. Hamad says the five-star green building will be the “beacon” to create more excitement and attract more interest to the whole development. This will be followed by two subsequent phases comprising a shopping complex and condominiums. The whole development, to be undertaken over a 10 year period, will cost RM5bil. On the rationale for mooting the project, Hamad says: “Since the plan to develop the land was approved by the PNB board in 2004, we were waiting for the right time to proceed with the project. 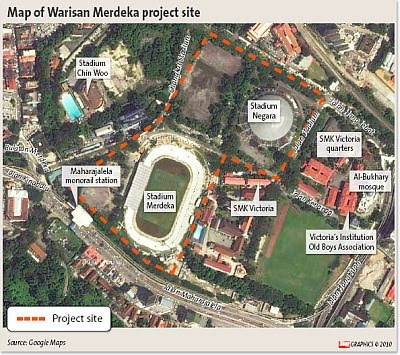 Hamad stresses that most importantly, by initiating the Warisan Merdeka project, PNB is taking the lead to preserve the historical value of Stadium Merdeka as the site for the country’s declaration of independence back in 1957. Emphasising that PNB is not looking to compete with anybody when it decided to put up a 100-storey tower as part of the Warisan Merdeka development, he says it will make more economic sense to build the high-rise tower than lower rise buildings. Meanwhile, the new tower will be able to meet PNB’s need for new office space in line with its strategic positioning for the future. Hamad says PNB will be moving out from its present headquarters, Menara PNB, which will be 30 years old when the tower project is completed, to the Warisan Merdeka tower upon its completion. PNB has set up wholly-owned unit, PNB Merdeka Ventures Sdn Bhd to undertake the project. Helming it since early this year is Tengku Abdul Aziz Tengku Mahmud who was formerly from Guthrie Property Development Holding Bhd and Sime Darby Property Bhd. So, will Warisan Merdeka be an iconic project and will there be foreign expertise involved such as the like of world renowned architect Cesar Pelli who designed the Petronas Twin Towers? Hamad says the project design plans are still in the drawing board. “We are in talks with several parties comprising experts from the relevant fields. We are exploring the possibilities of creating a strong architectural and engineering team for the project,” he adds. With its latest venture, PNB is certainly thrusting ahead with its plans to build up its presence in the local property scene.